“Being young and inexperienced in that kind of country precluded any feeling of futility as to my ability to select a good homestead site…at the time the distance from no-where meant nothing. The wilderness fever ran high”. (Harold McKinstry). “According to present day living standards, we would all have been classed as sub-standard and poverty stricken. It was the usual thing for families of 4 or more to be living in a one-room cabin. But none of those pioneers felt abused, only lucky” (Linda McKinstry). The text is taken directly from excerpts of Linda and Harold’s memoirs which were graciously donated to the museum in 2013 by their youngest daughter, Stella McKinstry. Images are paired with photos from the McKinstry family albums and the museum’s archives. “The Last Homestead” introduces audiences to the long history of homesteading the public domain while underscoring the particular difficulties such an enterprise posed in the Rockies. It takes on an early 2Oth century frontier/homesteading story – one not often told. As the photos and text make abundantly clear, this is a story of challenging (to say the Ieast!) transportation, deep and lasting snows, sub-zero temperatures, social isolation, the necessity of planning for months of meals without access to grocery stores, and the dedication of community members to helping one another (perhaps most heroically the one medical doctor in the town of Jackson who would cross-country ski for miles to reach patients in need). 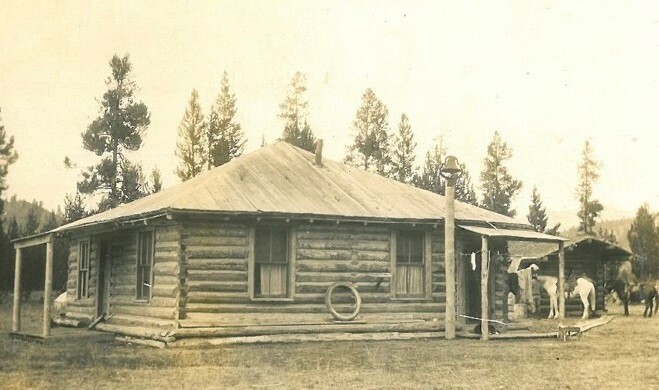 The particular location of Moran, Wyoming – the McKinstry’s destination – however, posed additional interest and possibilities for examining themes not always associated with homesteading. The nearby presence of Yellowstone National Park posed “threats” to ranching as the National Park Service began to cast covetous eyes on the scenic beauties of Jackson Hole (to the south). The contest over control of the lands, then, enters this story. Would it remain private and devoted to agriculture or would it return to the public fold and so be devoted to tourism? Interestingly, the McKinstrys felt threatened at first but eventually sold their land which now falls within the boundaries of Grand Teton National Park. In addition, the story of Linda McKinstry uncovers the too-often hidden experiences of women homesteaders. An educated woman, with virtually no ranching experience, she represents a particular type of “new woman” in 20th century Wyoming….an urbanite ready to give homesteading a try but also well aware of all she has given up to do so. This engaging exhibit builds upon a wonderful collection of family photographs, donated to the Jackson Hole Historical Society and Museum in 2013 by Stella McKinstry, the youngest daughter of Linda and “Mac” McKinstry who homesteaded in Jackson Hole in the early years of the last century. The text derives from the jointly written memoirs of their story. 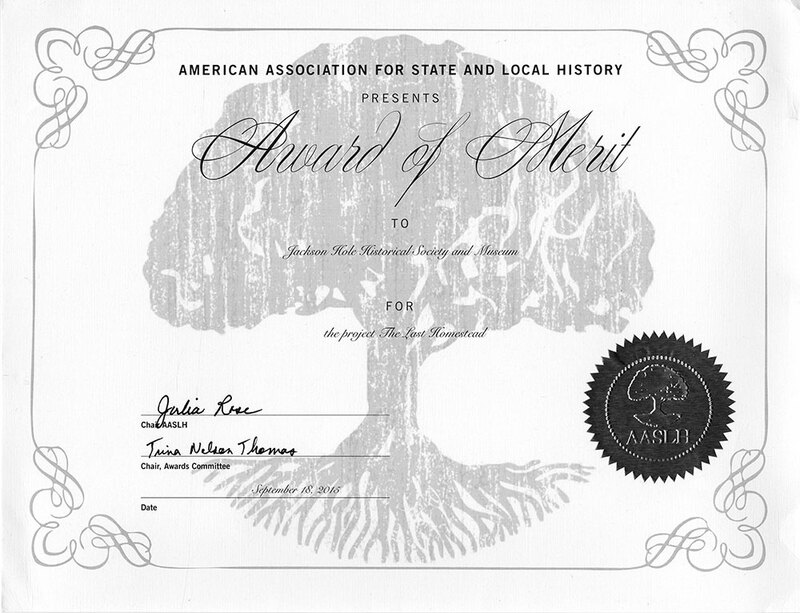 The combination of stunning images and words produces an evocative, even visceral, sense of life in early twentieth century Jackson Hole that won the “The Last Homestead” the Award of Merit prize (May, 2015) from the American Association of State and Local History. Most Americans probably associate “homesteading” with the 19th century, particularly since the legislation that provided people with the opportunity to gain a slice of the nation’s public domain under the auspices of the Homestead Act dates to the Civil War era. Interestingly, much of Wyoming – with its arid high plains and mountains – did not attract significant numbers of homesteaders until the turn of the 2Oth century. A number of factors explain this, including the greater attraction of better farmland and easier access to transportation elsewhere. However, as prices for agricultural products increased and a “back to the land” movement swept the country, Wyoming’s high, dry grasslands beckoned. 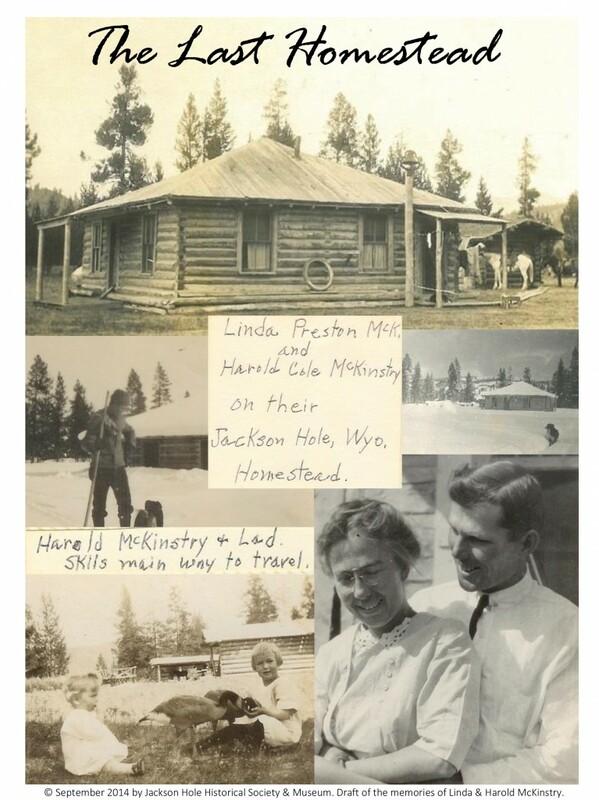 Linda and Harold McKinstry took up the challenge and arrived in northwest Wyoming in 1915. This exhibit exhibit relies entirely on primary sources. The photos and text are one-of-a kind documents that have never been published. The advantage of this approach is that it takes the viewer deeply into the lived experience of the McKinstry family and their friends. For example, the photo and description of the Budge boy’s funeral, in the rough winter weather, is much more effective than a second-hand telling could possibly be. The power of the images and words largely speak for themselves. The Jackson Hole Historical Society and Museum sits in a small town, yet a place the world loves to visit. Jackson Hole is an international destination, with visitors from China, Europe, and South America, an everyday event. This exhibit, therefore, has great reach beyond northwest Wyoming. It truly has a global audience and teaches many people a new story about “westward migration,” homesteading, and the human spirit’s ability to overcome incredible hardship for the sake of family.